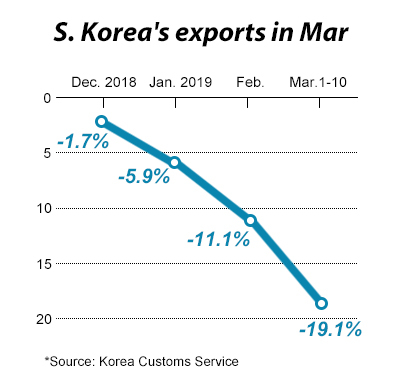 South Korea’s exports will likely extend and widen losses for the fourth month in a row in March with shipments in the first 10 days tumbling 19 percent. According to data released by the Korea Customs Service on Monday, the country’s exports totaled $11 billion in the first 10 days of March, down 19.1 percent from a year-ago period. Daily exports averaged $1.83 billion, also down 5.6 percent from a year earlier, based on six working days, a day shorter than a year ago. The country’s outbound shipments fell for the third month in a row in February, the first extensive decline since 19-month losing streak in October 2014-July 2016. Depreciation in chip and petrochemical products ate into shipment value. From March 1 to 10, semiconductor exports shrank 29.7 percent on year. Exports of petroleum products contracted 39.0 percent, ships 9.7 percent, and wireless communications devices 4.1 percent. Shipments of automobiles and white goods, however, were up 5.2 percent and 7.4 percent, respectively. By country, exports to China tumbled 23.9 percent, the U.S. 17.0 percent, the European Union 10.2 percent, Vietnam 18.4 percent, and Japan 29.3 percent. The country’s imports in the first 10 days were off 15.4 percent to total $11.6 billion largely due to a 10.6 percent fall in equipment imports by chip makers, delivering a trade deficit of $640 million for the cited period.